About three weeks ago, I was in a Pittsburgh casino for the beginning of a 20-day man-versus-machine poker battle. 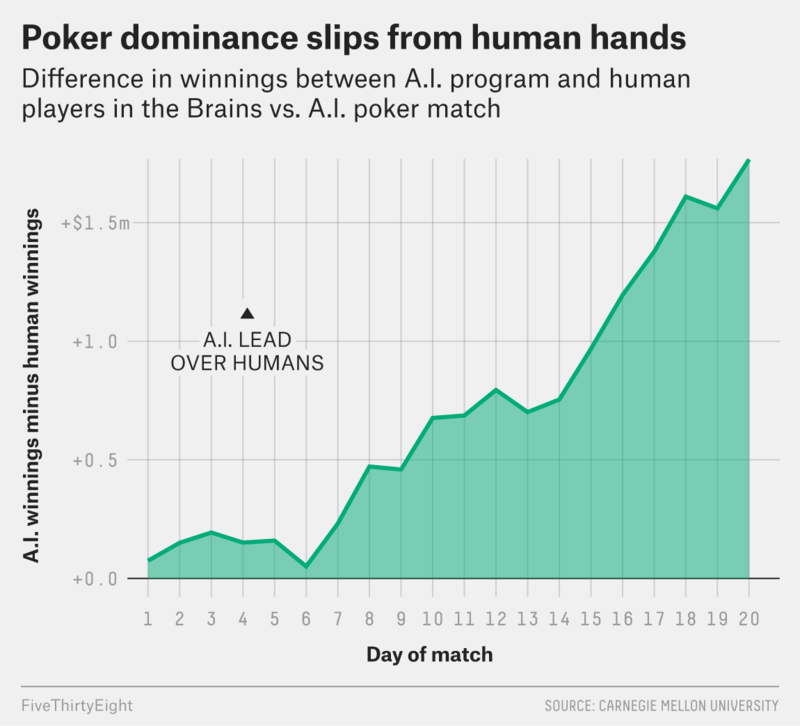 Four top human pros were beginning to take on a state-of-the-art artificial intelligence program running on a brand-new supercomputer in a game called heads-up no-limit Texas Hold ’em. The humans’ spirits were high as they played during the day and dissected the bot’s strategy over short ribs and glasses of wine late into the evening. Tuomas Sandholm, a Carnegie Mellon computer scientist who created the program with his Ph.D. student Noam Brown, was giddy last week on the match’s livestream, at one point cheering for his bot as it turned over a full house versus human pro Jason Les’s flush in a huge pot, and proudly comparing Libratus’s triumph to Deep Blue’s monumental win over Garry Kasparov in chess. And, indeed, some robot can now etch heads-up no-limit Texas Hold ’em (2017) — alongside checkers (1995), chess (1997), Othello (1997), Scrabble (c. 2006), limit Hold ’em (2008), Jeopardy! (2011) and Go (2016) — into the marble cenotaph of human-dominated intellectual pursuits. Another of the human pros, Jimmy Chou, had had just about enough of Libratus.